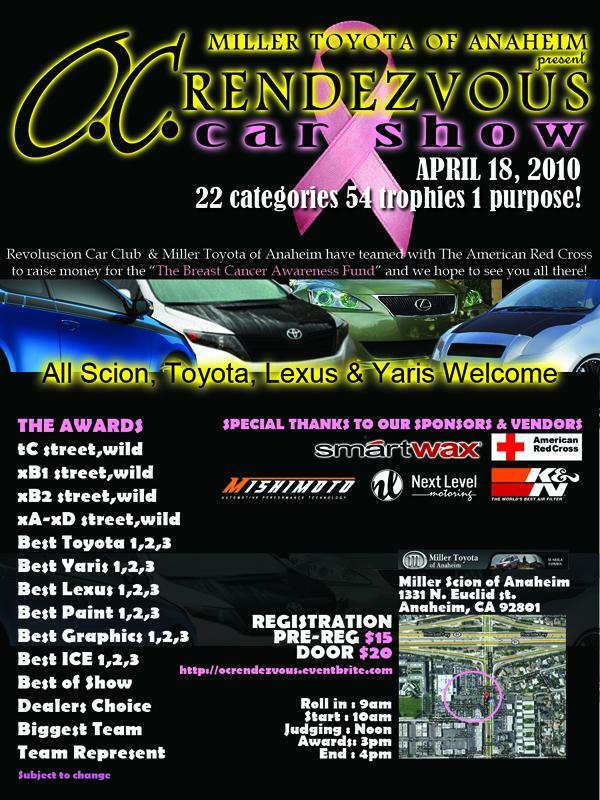 Mishimoto has teamed up with the Revoluscion Car Club to sponsor the Rendezvous Series Car Show in Anaheim, CA on April 18th 2010. The event is to being held to raise money for "The Breast Cancer Awareness Fund" set up by the American Red Cross. With 22 categories and 54 trophies, it promises to be a great event all in the name of an extremely worthwhile cause. All Toyota, Scion, Lexus and Yaris owners are encouraged to register! The Show will take place at the Miller Toyota of Anaheim; located at 1331 N. Euclid Street, Anaheim, CA 92801. Beyond sponsoring the event, Mishimoto has also donated several raffle prizes so even if you can't show off a vehicle, you still have a chance to win a gift certificate to Mishimoto.com! Roll in time starts at 9am, judging at noon, with awards at 3pm. Pre-registration is $15, or you can enter at the door for $20, with proceeds going towards "The Breast Cancer Awareness Fund." You can find out more info about the event and register by clicking here.